Lacey Maier of New Salem, North Dakota, represented the North Dakota Stockmen’s Association at the recent National Cattlemen’s Beef Association’s (NCBA) Young Cattlemen’s Conference. The tour took young industry leaders on a comprehensive tour of industry hubs beginning in Denver, and concluding in Washington, D.C.
Maier grew up on a cow-calf operation near New Salem before earning a bachelor’s degree in animal science from North Dakota State University (NDSU) in 2010. While attending NDSU, Maier also took part in the Feedlot Management Internship Program at the University of Nebraska-Lincoln. Since graduation, she has returned to her family’s operation as the fifth generation to manage the 350-head commercial Angus cowherd and 1,500-head backgrounding feedlot. For Maier, the exposure to beef producers from across the United States proved an eye-opening experience. “It was interesting seeing the people and places from all sectors of the industry with the producers from all different backgrounds who were on the trip,” she said. The group’s tour began at the NCBA headquarters in Denver, where YCC participants got an inside look at many of the issues affecting the beef industry and the work being done on both the state and national levels to address them. While in Denver, CattleFax provided a comprehensive overview of the current cattle market and emerging trends. At Safeway, the participants received a firsthand account of the retail perspective of the beef business and then toured the JBS Five Rivers’ Kuner Feedyard and the JBS Greeley packing and processing plant. From Denver, the group traveled to Chicago, Ill., where it visited the Chicago Board of Trade, learning about risk management and mitigation tools available to the cattle industry. In Chicago, participants also visited McDonald’s Campus and OSI, one of the nation’s premier beef patty producers. After the stop in Chicago, the group concluded its trip in Washington, D.C., with issues briefings aand agency and Congressional visits. Maier visited each of North Dakota’s Congressional delegation offices, where she shared information about issues related to trade and the Waters of the United States rule. 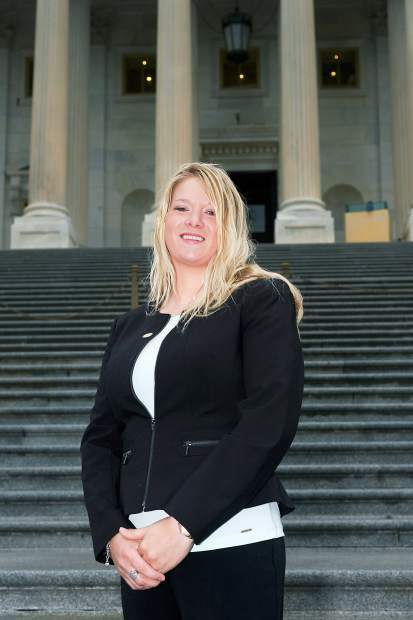 She said the opportunity to meet with national leaders from North Dakota and across the United States will better prepare her to promote the beef industry in the future. The North Dakota Stockmen’s Association selects one representative to participate in the Young Cattlemen’s Conference each year. To learn more, call 701-223-2522.